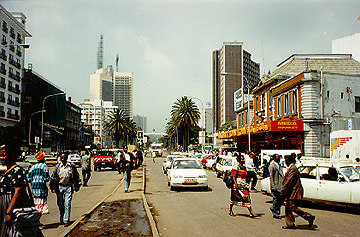 Nairobi is the crowded capital of Kenya. 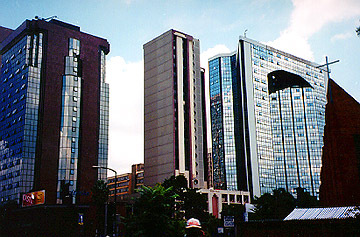 Like most cities, it has fancy business districts and dirty slums. I spent a full day and a couple of half days wandering around the city. There is a nice museum with the actual skulls of some of man's earliest ancestors. Other attractions include the train museum, city market and statue of Kenyatta, the founder of Kenya. 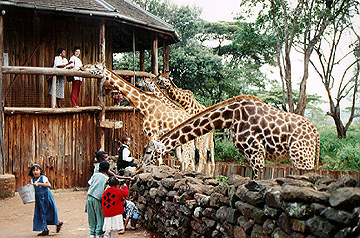 At the Langatta Giraffe Center, the tame rothschild giraffes can be hand fed with pellets supplied by the center. They have a big purple tongue which will slime your hand like a dog if you're not careful. Below the giraffes, warthogs grab dropped pellets. This is part of a conservation effort for rothschild giraffes. We stopped by the Karen Blixen Museum. 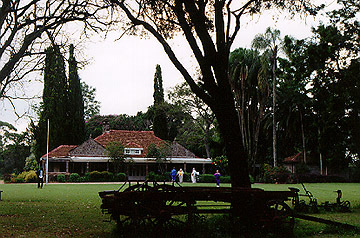 This is the former home and farm of Karen Blixen who wrote the novel Out of Africa under the pen name Isak Dinesen. The movie is based upon this true story and some scenes were filmed here. 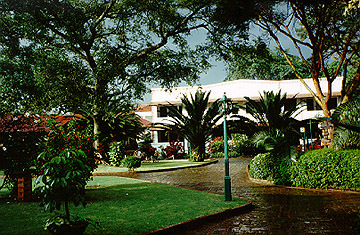 The courtyard of the Norfolk Hotel in Nairobi. It was built in 1904 and was used by hunting safaris of Winston Churchill and Teddy Rosevelt. 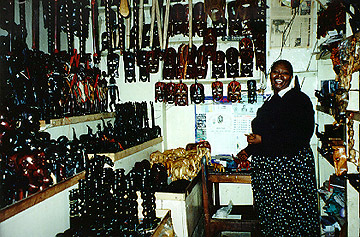 Shopping for carved animals is a lot of fun but be prepared to bargain and to carefully check the quality. Like many of the merchants, this friendly woman told me I "was her first customer" and she'll "give me a good deal" since she wants the good luck.